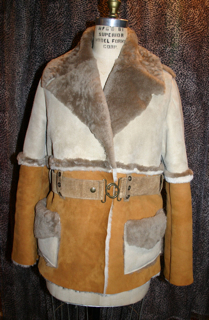 This interesting 2 toned shearling jacket has soft cut edges and seams that show the fur. 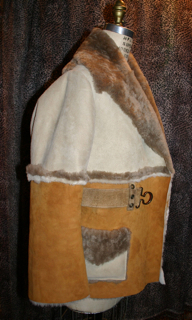 The shearling skins are suede on the outside with the natural fur on the inside. 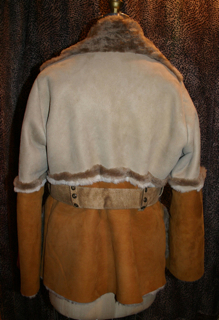 About hip length with the line of an empire waist accentuated by the exposed fur and a belt that fastens the jacket closed. Featuring a slightly flaired sleeve, patch pockets and a full and large collar and lapel in the exposed fur. There is a variety of colors and combinations to choose from. By Custom Order.